This Bobrick towel roll dispenser is a great way to keep your bathrooms tidy. Because this towel roll dispenser has a built in, removable 12 gallon waste container that locks in and that your patrons and employees can dry their hands and immediately dispose of the paper. This reduces messes and increases space efficiency. This towel roll dispenser is surface mounted and it is a great idea to locate it directly beside your sink. This allows users to dry their hands quickly and all in one place so that water isn't splattered on the floor. 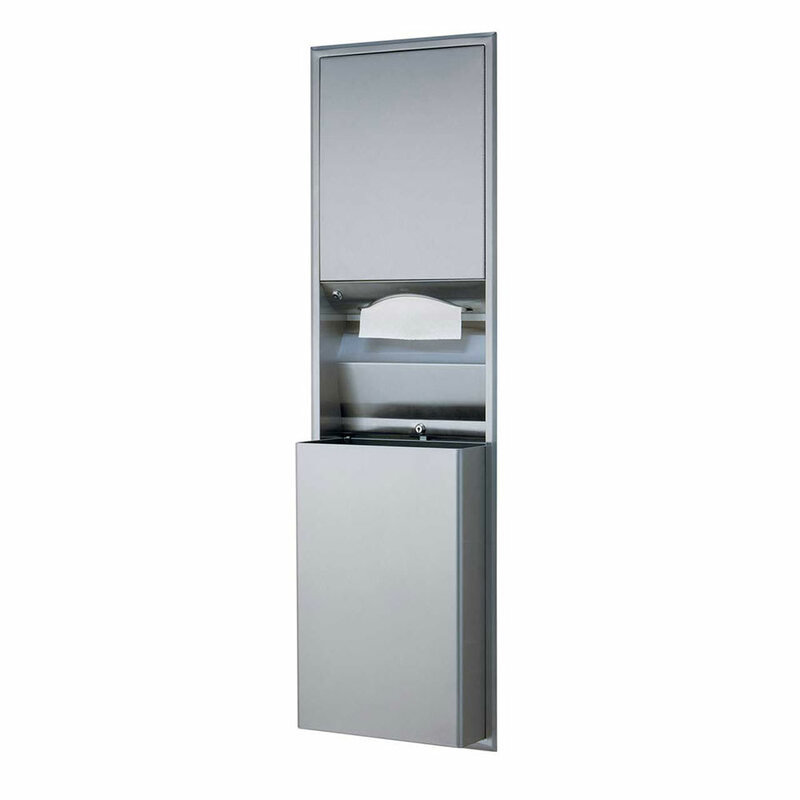 Included with this roll towel dispenser waste receptacle is a flush tumbler lock and seamless beveled flange. This roll towel dispenser dispenses an amazing 600 C-FOLD or 800 Multifold towels and because of its satin stainless steel finish it is easy to clean and looks beautiful in any restroom. 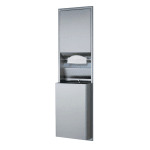 Classic Series Recessed Convertible Paper Towel Dispenser / Waste Receptacle, Unit includes convertible folded paper towel module and 12-gallon waste receptacle. Satin-finish stainless steel. Seamless beveled flange. Dispenses 600 C-fold or 800 multifold towels. Removable waste receptacle locked into cabinet. Receptacle is 8" (205mm) deep with capacity of 12?gal. (45.5?L); extends 4 1?8" (105mm) from wall. Rough Wall Opening: 16" W, 54 3?4" H, 4" min. depth (405 x 1390 x 100mm). Field conversion made easy without replacing existing cabinets in wall.